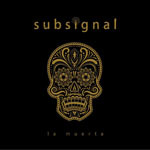 Share the post "Album review: SUBSIGNAL – La Muerta"
Or, translated to English – The Dead, by German progressive rock outfit Subsignal. Their fifth studio outing, I was expecting something a bit ‘blitzkrieg’, but was pleasantly surprised to find that despite some modestly aggressive guitar lines from founder Markus Steffen, co-founder Arno Menses’ melodic vocals place Subsignal firmly in Asia/John Wetton territory. It puts some distance between previous releases, and in particular their last outing The Beacons Of Somewhere Sometime (2015) by waving ‘goodbye’ to the band’s metal tendencies and putting their faith in the strength of their song writing. And in a highly impressive way, with Ralf Schwager (bass, ex-Dreamscape), Markus Maichel (keyboards) and Dirk Brand (drums) now completing the line-up. There’s also shades of Jon Anderson (circa Wonderous Stories) evident on numbers like ‘Every Able Hand’, and when the band diversify, as on ‘Even Though The Stars Don’t Shine’, there’s strains of the likes of The Police and The Cars.